There is only one narrative that can lay claim to being “the greatest story ever told” and we hear that very phrase, immediately and perhaps predictably, at the beginning of “Jesus: His Life,” the eight-part History series beginning on Monday, March 25. Who can argue? Well, as it happens, some of the people who appear in the show. A new series on History approaches Jesus and his followers as humans rather than as stained-glass icons. Judging by the first two episodes (the only ones made available to critics), they also approach the figures being addressed as humans rather than as stained-glass icons. Mary’s post-Annunciation reveal that she was pregnant “must have ripped Joseph’s heart out,” offers Robert Cargill, assistant professor of Judaism, Christianity and Classics at the University of Iowa. The re-enactment of an enraged Joseph (Ramin Karimloo), trashing the house he has been building for his betrothed, is good; it knocks his halo askew. It also prompts a viewer to ask how he or she would respond to what one witness concedes would have been a “ridiculous” story. Professors Shively Smith and Mark Leuchter, she of Boston University, he of Temple University, address the severity of ancient Jewish law and the capital crime of adultery; Joseph might have “outed” Mary if he were a lesser man. Which he was not. “Jesus: His Life” addresses the New Testament as history and literature—even benign propaganda. Cut to Professor Ben Witherington III, of Asbury Theological Seminary, who counters by saying it is “perfectly plausible” that some kind of taxation edict forced the holy couple to return to Bethlehem. His evidence is circumstantial, and not as strong as Cargill’s, but the existence of such debate puts life in the program. One of the events discussed is the Slaughter of the Innocents, of which there is no historical record. But according to Cargill, Matthew was “obsessed” with connecting Jesus to Moses, and their mutual escape from a massacre—Moses’ instigated by the Pharaoh, Jesus’ by Herod—helped him do that. James Martin, S.J. : Why was Jesus baptized? But given the academic rigor evident in the first two chapters, the series seems a useful way to examine the points of Jesus’ life in a thorough and authoritative manner—without reflexive adoration and perhaps even with a little a bit of cheek. “John the Baptist was a giant pain in Herod Antipas’ backside,” notes Adam Marshak, author of The Many Faces of Herod the Great. No beating around the bush, burning or otherwise. I have not yet viewed any of these episodes, but it appears from this review that the perspective taken by the writers of the series is not as broad or as academically rigorous as is suggested by Mr. Anderson. 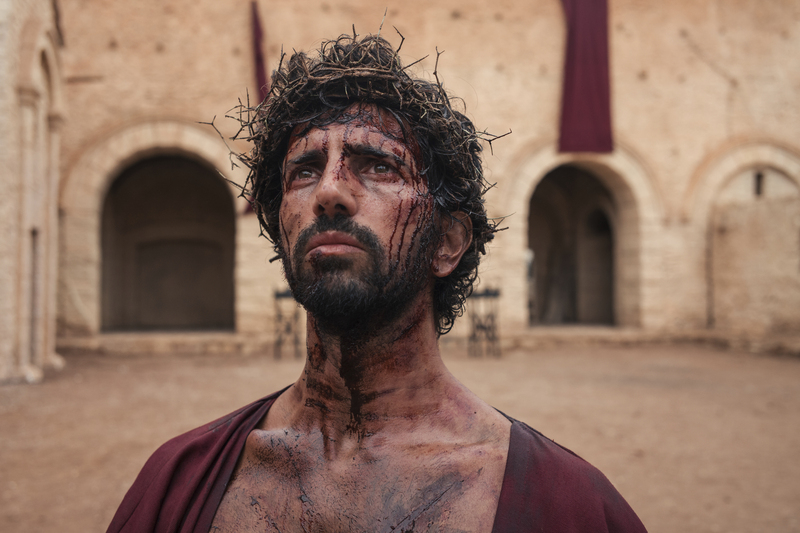 The the title of this America article, "'Jesus: His Life’: a fresh take on the world’s most studied character," suggests tension between the assumed historicity of Jesus and his place in the Gospels, in whole or in part, as a literary character. In my opinion, the following article from The Conversation website, which strives to maintain academic rigor, has a more appropriately objective perspective than the above article suggests is found in the series under review. As I've said, I have not yet seen any installments of the series, so it might actually be the case that the writers do in fact make at least a nod toward the possibility of Jesus's ahistoricity. But it doesn't look that way from the title, "Jesus: His Life." None of this diminishes the role of faith, but it possibly does require a little more of it from the get-go. Academic rigor is precisely what this show and article lack. You need to read real (and also non-American) scholarship on the quest for the historical Jesus. He can’t be found. He slips away. If the real Jesus taught anything, He taught us to not trust our own selves when we commit the sin of pride. What are the odds of those congratulating themselves for claiming to have done what no one else has thought to do in two thousand years, despite having generating whole libraries of books on the subject matter, without having their thought distorted by see-how-much-more-enlightened-I-am sins of pride? To James Haraldson. If your moral warning or assessment is aimed at me, thank you for your concern. But know that I am far from happy or smug about my not being able to continue to assume Jesus’s historicity, objectively or probabalistically speaking. It’s not my fault that whatever evidence might once have been available to objectively substantiate historical Jesus was not preserved to the current day. Neither is is my fault that my God-given personality and character have driven me to track down every lead through every available door to attempt to connect all available historical dots back to the very origins of Christianity. I remain on the same lifelong spiritual path. But now I find that the founding story needs to be rethought and reframed by objective scholars in light of what currently is known and knowable. In the meantime, the Church ought to admit that historical Jesus is an article of faith based on traditional belief., and not something that is grounded by currently available objective evidence. It took me a couple of years of wrestling with my findings to be able to come to grips with them. The assumption that some sort minimally historical Jesus is at the root of the Jesus character found in the New Testament is fully baked in to American culture, but objective evidence is lacking. The assumption that Jewish history as depicted in the Old Testament is at least minimally historical is likewise baked in, or nearly so. But corroboration of any kind is virtually totally lacking. Again, the entire collection of stories,including every character, requires faith in order to be accepted in these modern times. To me, it’s a matter of honesty and authenticity. There wouldn’t be a problem if the Church would have kept up with modern knowledge instead of always being decades or centuries behind. I'm sorry to see how ignorant your are on the subject of Christology, an ignorance you fortify with a condescending assumption that the Church has not constantly reexamined historical evidence. It's scholars have only written tens of thousands of books on matters that you assume are limited to articles of faith. It is also rather condescending to assume that the matters that are articles of faith, such as the idea that God is not necessarily an idiot who would allow the faithful Church people of the past or present to have been senselessly deluded, can simply be trivialized to a mere cultural artifact or tradition. If one takes the perspective of a believer, then the evidence is supportive. But if one takes the perspective of total open-mindedness, then the objective evidence is insufficient. I found that it is very difficult for a believer (myself) to take the perspective of total open-mindedness, and I had to adapt to that perspective over a period of about two years. On the other hand, I've concluded that it is not possible to disprove Jesus's historicity, again, on the basis of currently available objective evidence. And on the other other hand, I've learned that it's rare to find oneself in a situation where one is able to have a non-emotional, purely rational conversation about this subject without pushing peoples' buttons. Only very rarely are people respectful or curious enough about the grounding of my position to ask me to clarify it for them. This conversation is an illustration. To reiterate my original point, it is clear to me that the perspective contained in the following article is absent from the review under discussion. That perspective is itself offensive to many religious believers and even to many non-believers because it goes against the culturally baked-in assumption of Jesus's historicity. Any further productive discussion here would better focus on that article rather than on my own moral character. Or better yet, because doing so would move this comment thread seriously off-topic as a TV review and also would push many religious buttons among readers of this website, we could just note our disagreement and leave it at that. I won't be responding to any more personal insults or assessments of my character. I therefore question how well rounded the series set out to be, or how much of the ideological spectrum was consulted. That said, the videogaphy (or cinematography?) and the actors are beautiful -- in a contemporary sort of way.